In the early decades of the century there were only mud roads which were on the whole in a poor condition. Wades were the village carriers succeeding Cann, Robins, Hugh Oke, Bill Hayman and perhaps others of the previous century. The fine weather we have been enjoying has brought several visitors to the village during the past week. One of them was eloquent in the praise of our spacious square and the 'fine, clean-looking houses' which surround it. What he did not praise however, was the roads that lead to Bradworthy. He had come from Hartland, and the road he had traversed after he left the main road had been bad enough to break the springs of his car, he said. One was pleased to hear the visitor's compliment to our village, but displeased, though sympathetic, with his complaint regarding the roads. Nearly all the roads by which one enters Bradworthy are in an unsatisfactory state of repair. And it is strange that one of the worst is our main road to the sea at Bude. From Trentworthy Cross down to the Cornish border, this road is in a deplorable condition. We heard a good deal at one time about a suggestion that this road should be renovated and tarred, as it was a good 'short cut' through from the Cornish coast, to Bideford, via Bradworthy. 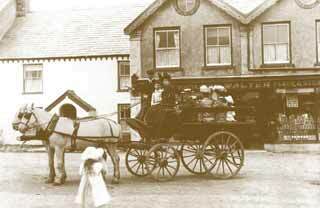 Devonia near the Bradworthy Inn in 1906. Willie Found started a motor bus service in the early years of the century linking Holsworthy, Sutcombe and Bradworthy. 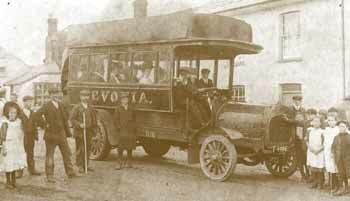 The bus was named 'Devonia'. Unfortunately on the 16th August 1908 the vehicle overturned on Sutcombe Mill hill and a police sergeant was killed. John 'Cycle' Jennings is said to have brought the first car here in 1908. Horse drawn vehicles continued for several years more, the conveyances, brakes and wagonettes becoming more sophisticated. Edmund Jennings appears to have been in the carrier trade for a time, but a note in an old newspaper states that his son-in-law, Alfred Elliott, bought off (again in 1908) Albert Wade's horses and carriages and 'he intends the carrier's van to ply to and fro as heretofore'. Arch Dayman, watching at Little Ford, saw the first car coming towards Bradworthy from the direction of Holsworthy. He dashed back into the village and exclaimed "It ain't an 'orse, an' it ain't a cart. It's goin' like 'ell, an' it's smokin'." It was Alfred Elliott who made the changes from horses to motor transport. Two London cyclists riding on a tandem down Bradworthy Mill Hill had a narrow escape from serious injury when they were involved in a collision with a car. The cyclists were Charles Sidney Moggridge, who was riding in front, and William George Nash. The force of the impact hurled Moggridge through the windscreen; Nash was somersaulted over the top of the car and landed in the road. Dr. N. Betts and P.C. Horwood were quickly on the scene, and the cyclists were conveyed to Bideford and District Hospital, where Moggridge was detained with a knee injury. Later the carriers were Charles Wade (Albert's brother) and Arthur Oke. 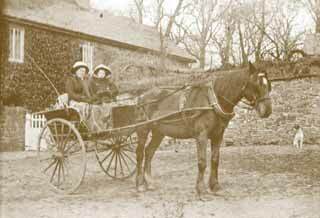 They ran their charabancs regularly over the Holsworthy and Bideford routes and were also available for outings and tours. The National Bus Company eventually bought them out. At the Parish Council meeting a letter was read from the Southern National Omnibus Company, stating that they were changing the time of their service to Bideford on Saturdays. In 1950 there were three taxi services at Bradworthy. In the last half of the century there has been much improvement in the rural roads network, but they are still of a low grade. A road accident at Blagdon Moor Crossroads, involving a Bradworthy farmer's car and a one-ton pick-up truck was described at Holsworthy Court on Friday. The defendant held an unblemished record of 30 years' motoring. Holsworthy, via Bradworthy, to Bideford is a grade 3 road. What is known as a connector road runs from Kesmeldon to Meddon through the north of this parish, and a parish link road runs from the Atworthy area to the village. For a number of years the only regular public transport has been a bus to Bideford on Tuesdays, and to Holsworthy on Wednesdays. In 1994, with the aid of European Union funding, Jennings and Hookways run a bus to Bideford 5 days a week (6 in the summer). Bradworthy is situated where four roads meet. There are eight bridges quite near the village. We haven't a railway station at Bradworthy so we hire a taxi, from Mr. Wade, Mr. Wickett that owns the garage in the higher village, and Mr. Bromell who owns the garage in the lower village. Mr. Bromell's taxi is big and is used mostly to take bellringers and groups like that about. We have a bus service twice a week to Bideford, on Tuesdays and Saturdays. It leaves Bradworthy 9.17am. and gets back again 5.18pm. On Wednesdays there are two buses to Holsworthy besides the school bus that takes the children to school every day. The first bus for Holsworthy leaves the Square 11.06am. and returns to Bradworthy 5.58pm in the evening. Once a month a Jennings bus runs from Morwenstow to Exeter and Plymouth. There's a bus that runs from Bradworthy to Bude to the pictures every Saturday night. Gwennyth Cheese, who was a young 13 year old school girl when she wrote this in 1949.